56.5 kilometres away from Central London, you will discover one of UK’s largest passenger airports. 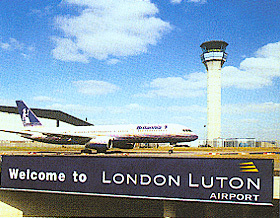 It is called London Luton Airport and it bears behind a history of around 75 years. Every year, there are almost 9 million passengers departing and landing on Luton. They fly mostly with EasyJet, Monarch Airlines, Thomson Airways and Ryanair. London Luton Airport is located on the top of a hill, overlooking River Lea’s Valley and London. It also offers views over the Chiltern Hills. The airport was opened in 1938 and it was used even during the World War Two. During that period, it was the base for Royal Airforce Fighters, but it was also utilised as an international commercial airport. In the recent years, meaning 2005 and 2004, a new departure hall, a new terminal and a new runway have been constructed. If your flight to London will land on London Luton Airport, there are a few things related to the transport to the Capital that you must bear in mind. First of all, if you are looking for a fast and secure transfer, you should make use of a Luton Shuttle service, like the one 247 Luton Airport Transfer offers. Secondly, when booking a Luton Shuttle, you have to take into consideration the following aspects. Contact the minicab company you want to travel with and make the booking in advance, so as to be sure that they will have a transfer available exactly when you need it. There are various ways of getting in touch with such a company: phone, e-mail, live chat or online. Also, make sure to always ask for a quote first and if the price is too high, you can search for a company with more affordable fares. The price is fixed, so what you’ll be getting in the quote, will also be what you’ll be paying at the end of the journey. The black cabs are also considered as Luton Shuttles, but the main recommendation is to stay away from them. Yes, they are symbolic for London, but they can charge you double the price of a minicab. Not to mention that they cannot carry more than 5 passengers. So, if you travel with a larger group, you will most definitely need a Luton Shuttle service offered by a private hire company. If you choose the right minicab company, you can be positive that you will always get safe and in time to your destinations. Moreover, you will always be accompanied by courteous drivers that will wait for you at the airport and help you with your luggage. 247 Luton Airport Transfer’s meeting point at the London Luton Airport is Costa Coffee, a coffee shop situated outside the Arrivals Gate. You will immediately recognise our drivers as they will carry a board with your name on it and they will be smartly dressed. They will smile when greeting you and they will be more than glad to help you with your luggage. If you choose to book a Luton Shuttle with 247 Luton Airport Transfer, you can call us 24/7, as we will be available for you. Also, you should know that such a service costs you £38 for a saloon car..